Located on the P.H.Young Ranch 25 miles south of Valentine. Section 12, Range 29, Township 31. 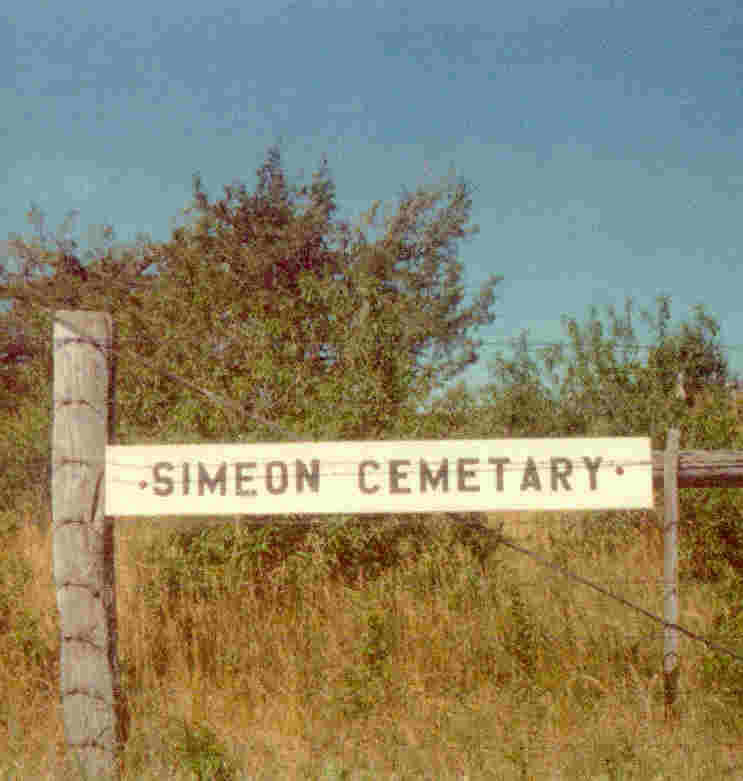 The well-kept Simeon Cemetery continues to reflect community pride and the philosophy "We take care of our own". The Simeon Cemetery is silent testamony of that pride. Located on a grassy knoll 25 miles south of Valentne, Ne. on th P.H.Young ranch, it is surrounded by rangeland and cattle, but eight strands of barbed wire insure that cattle will not trespass. Cedar tress rise to lofty heights on twisted trunks and the lower branches fan out in a diameter of 40 feet. Iris beds, some planted 75 years ago, surround the weather-streaked stones. Native grasses carpet the cemetery in a dense sod and continuous maintenance is quite apparent. A tall white stone marks the first recorded grave---John Hobbs, 1834-1887. The family plot includes the graves of his wife, Sarah, and seven children, each marked with a headstone. The plot is enclosed by an ornate iron fence. It was not until 1891, however that W.D. Morgareidge had C.G.Patterson, county surveyor, establishe the cemetery boundaries. Morgareidge donated the land and filed an official document to that effect to the county clerk, Oct. 31 of that year at 4 p.m. Another white marble stone surrounded by another iron fnece notes the Carson plot. John Carson took a homestead in 1882 in what became the Simeon community. His wife's name is carved on one side of the stone and his son, Alvin, on the other. Alvin drowned in an alkali lake April 20,1887. P.H.Young filed a homestead less than a mile from the cemetery in 1901. In 1904, Solomon Ellis, merchant and landowner, took Young's place on the chain while surveying land and was struck by lightning. Ellis was buried in the little cemetery which was included in land that Young later bought from Morgareidge. Stella Young told her children in later years how she and her husband handled the buriel of infants during the horse and buggy days. Mrs Young lined wooden raisen boxes with cotton batting and satin for a coffin while her husband prepared the grave and often conducted graveside services. "A community takes care of its own", she would say. Young's trademark was building long lasting fences. In 1947, he enlarged the cemetery and refenced the area with osage posts set 10 feet apart with eight strands of barbed wire. Buriel continued on through the years and the community gathered to groom the cemetery prior to each Memorial Day. In 1960, Young turned his records over to a daughter, Georgia Lord. That May, the entire community completely renovated the cemetery under the guidance of Frank Reece, Young's son-in-law. By using the original map and added research, it was learned that instead of four, there were actually five rows of 20x30 foot lots and four 10 foot allys. Cemetery markers were then placed at the corner of each of the 30 lots, stones straightened and cement markers replaced the cedar post markers which had deteriorated. Stone and petrified wood, often used to mark a baby's grave, were uncovered from the sand and recorded to make a total of 58 graves. Morgareidge established the post office in June of 1885 and named it for his brother, Simeon. That November Elias Stilwell was named postmaster. After the post office was moved, Stillwell's son,Rivers, and his other children, carried the mail from Simeion to Conterra. In 1926, Rivers Stilwell died a short time after preparing a grave for his little grandson, Forrest, son of Carl and Rossa Schleve. They were the first of the 11 members to be interred in the Stilwell family plot. While mowing hay in 1930, Carl Schleve found cedar seedlings growing on the meadow and transplanted three of them to the cemetery. Rosa Schleve Gillespie was buried in the Stilwell plot 1983. Georgia and Elver Lord carefully checked plot boundries and four of P.H.Young's decendants prepared the grave,grandsons, Bobby Lord, Bud Reece, Paul Young and great grandson, Kevin Reece. They take care of their own. This story was written and donated by Marianne Beel of Valentine, Ne. Leach, Louis(hus of Joan Galligher) ? ? 3 unknown graves+ 1 unknown grave , possibly Alvie	Carson who drowned in Big Alkali in 1887.